Plandai Biotechnology Inc (OTCMKTS:PLPL) stock has surged during intraday trading due to recent developments. PLPL issued a sales forecast update for Q3 and also released its Q2 sales results. The stock climbed to an intraday high of $0.10 gaining over 50% at one point. It is currently trading up 9% at $0.071. In recent news and developments, Plandai Biotechnology Inc (OTCMKTS:PLPL) announced that this is the first quarter of sales. The sales were shipped and sold across four continents: South Africa, Europe, Australia, and India. Over a half a ton (640kg) of Phytofare® Catechin Complex were sold and shipped to customers during the quarter. As for the forecast for Q3 and the coming months, PLPL’s goal is to reach about 500kg of sales per month. If the trend continues as it has this should be a relatively easily attainable goal for Q3. It hopes to hit 1,500kg for Q3 which is almost double what it has done in the prior quarter. The company anticipates and has a set a goal to hit over 1 ton (1,000kg) per month by the end of the year. It is continuing to expand it sales across the globe. It expects to successfully expand into North America, South America, and Asia in the coming months. In other developments, Plandai Biotechnology Inc (OTCMKTS:PLPL) announced that it has nearly completed its 2015 audit results and expects to file its Form 10-K in the coming months. Its quarterly reports will require more time but should be filed shortly thereafter. PLPL had to delay the release because the auditor had resigned just a few days prior to the original filing deadline. PLPL. and its subsidiaries develop highly phyto-available™ extracts. Plandaí Biotechnology controls every aspect of the process, from growing the raw materials on its farms in South Africa, to producing its proprietary Phytofare® extracts in-house, allowing the Company to guarantee the continuity of supply as well as quality control throughout the entire process. Targeted industries for the Company’s products include beverage, cosmeceutical, wellness, nutraceutical, anti-aging, and pharmaceutical. PLPL is currently trading at a $12 million market valuation. The company is about to grow exponentially with its new product and the rapid traction it is gaining. It expects to eventually reach over one ton of sales per month compared to its current goal of half a ton per month. This exciting story is just beginning. Stay tuned for more updates. 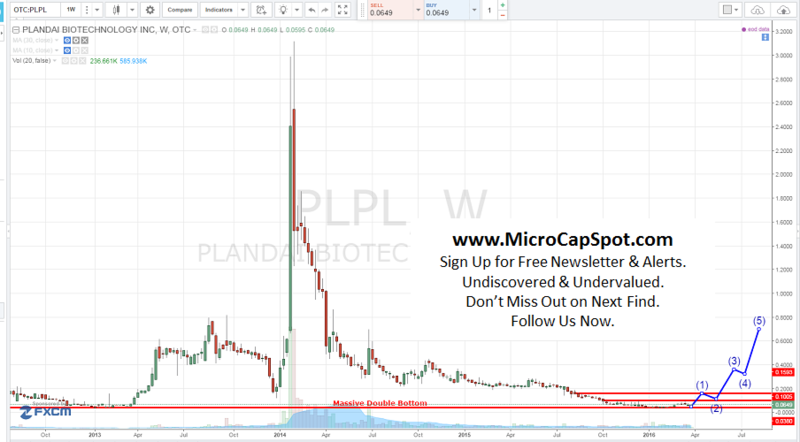 We will be updating on PLPL when more details emerge so make sure you are subscribed to Microcapspot so you know what’s going on with PLPL. Disclosure: we hold no position in PLPL either long or short at the publication of this article and we have not been compensated for this article.